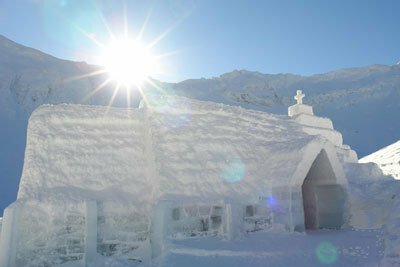 Take the whole family away this Easter to the Ice Hotel in Romania. Untravelled Paths is offering an exclusive, family-friendly four-night retreat from 29th March to 2nd April 2013. Prices start from £415 per person and include B&B accommodation, transfers and a treasure hunt on Easter Sunday. Children under 12 go half price. Explore the spooky corridors of Dracula’s would-be residence, the forbidding Bran Castle; imagine life as a Romanian king amongst the decadent interior of Peles Castle; skip around the crumbling ruins of Rasnov Fortress, conjuring up the fort’s former grandeur and glory; unravel history on an informative walking tour in the medieval town of Brasov and see if you can find the narrowest street in Europe! Once everyone’s piled into the cable car, sit back and enjoy the ride up through the clouds past the snow-capped peaks of the Fagaras Mountains. Then, once you’ve explored the fairytale Ice Hotel, why not get the kids out in the fresh air and get involved in some snow-activities like ice-skating and sledging? Or, for those wanting to try their hand at something a bit more creative, there are ice-sculpting master-classes on offer for the whole family. Of course, you can always choose to kick back with a hot drink and just enjoy the sunshine, snow and scenery. In the evening, brace yourselves for dinner ‘on ice’ with a four-course meal complete with ice plates, frozen tables and frosty, fur-lined chairs then tuck yourselves into cosy sleeping bags before braving the night in your ice-suite. Rise and shine the next morning to breakfast, a customary hot chocolate and a treasure hunt in the snow, before wandering the cobbled streets of Sibiu then heading back to Bucharest for your final night. Celebrate Easter with a fun-filled family adventure for both the young and young at heart. Just £1,245 for a family of 2 adults and 2 children. The price includes 4 nights B&B accommodation, all excursions, all transfers, the UTP booklet and the services of a bi-lingual guide throughout. Price excludes flights. Low cost carriers Blue Air and Wizz Air fly direct from UK to Bucharest. Prices correct at the time of publication and subject to availability.